The Department of Social Development, through its agency called the National Development Agency, has started a number of projects to fight poverty. Among them are three projects in the Free State, which received a total of R1,8 million. The money is used to start or improve farming projects that not only help people to improve their lives, but also benefit the communities as a whole. The Rouxville Legal and Community Advice Centre was started as a place where people from the community could get legal advice. It also helped victims of unfair labour practices on farms in the area. Recently, the centre also became the heart of a farming project. Many people in the area are poor and struggling to meet their families' basic needs. 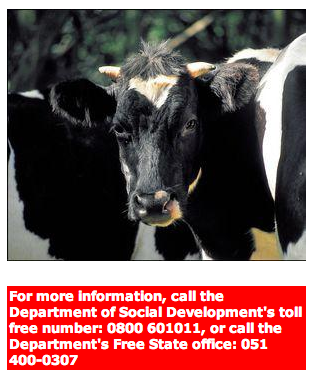 To help reduce poverty in the area, the National Development Agency gave the centre R470 000 to start a dairy farm project. The project will create jobs and supply the local community and businesses with fresh and cheap milk. 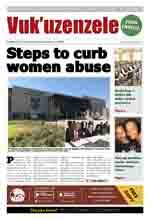 Another project that got funds from the National Development Agency is the Mantsopa Mother's Trust. The trust got R758 000 to further government's Joint Initiative for Priority Skills Acquisition (Jipsa). It will teach people skills like good governance, managing money and farming. The money will also be used to start a hydroponic farming project. Hydroponic farming is a method of growing vegetables in water that is enriched with nutrients, instead of in soil. Equipment needed to keep the project going include special tunnels, cold rooms for storing vegetables, nutrients, chemicals and seedlings. The Itsoseng Basadi Poultry project is run by 15 women. 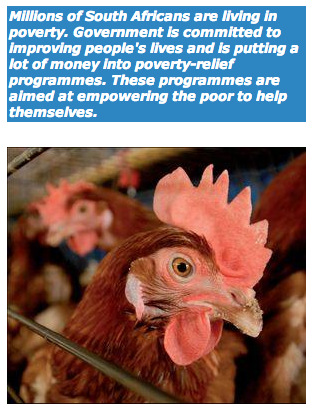 The project got R615 000 to repair and build chicken houses, and to buy poultry-farming tools, laying hens and feed. It will help the farm to grow and improve its productivity. The new buildings, for example, will have room for 5 000 laying hens instead of only 500. This will help the women to make a profit from their farming instead of just surviving.